Love is the universal language, so they say. Yet, how love is communicated varies greatly throughout the world. From classic trinkets to sappy love letters and beyond, love speaks volumes in many forms. I am blessed to have a melting pot of friends with different ethnic backgrounds in my life; and their love stories are, well, lovely. In Western culture, a kiss is a common act to display your affection to the one you love. Americans have tons of kiss-related traditions, like kissing under the mistletoe, kissing at midnight on New Year’s Eve and, of course, the first kiss as a married couple at the end of a wedding ceremony. But kissing customs vary worldwide and some countries even frown upon public displays of affection. Some say Europeans are more passionate and, since I’m married to a Spaniard, I’d be inclined to agree. Perhaps that’s why some Europeans kiss twice! In both Italy and France, for example, it’s standard to greet one another with a kiss on each cheek. Apparently, though, the French didn’t exactly invent the French kiss… According to YourTango, French kissing came from British and American soldiers returning home from Europe after World War I who greeted their ladies as they observed the “sexually adventurous” French to do with lusty, passionate kisses. Oh, la la! Three times a charm when it comes to puckering up in the Netherlands, says my pal Shaira. Dutch people greet by kissing each other’s cheeks three times alternately ― right, left and right again. I have to admit that I’ve had awkward encounters where I go in for a cheek peck and land on the neck or ear – so embarrassing – so the thought of successfully landing three kisses is high-pressure intimidation to me. 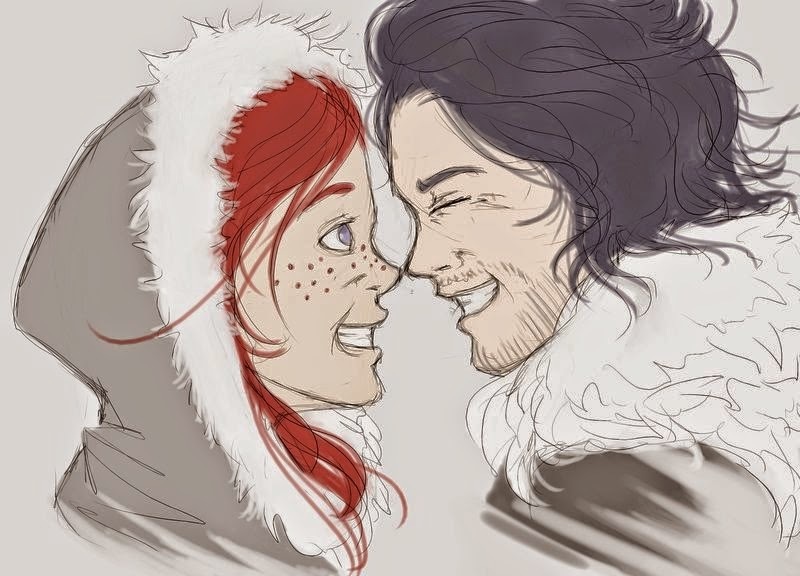 The Eskimo kiss is actually a traditional greeting of Arctic people known as ‘kunik.’ There’s a common misconception that this nose-to-nose kiss originated because standard mouth-to-mouth smooching could freeze saliva and literally lock lips together. Ha! The truth is that people dressed for cold temperatures may have much of their face covered (only leaving the eyes and nose exposed); and, so, the intimate act of Eskimo kissing allows greeters to sniff each other’s skin to remind themselves of one’s scent… or so they say. Similarly, Hawaiians and other Polynesian cultures use a ‘honi’ greeting by pressing noses and inhaling. It represents the spiritual exchange of the breath of life. Are kitchen gadgets romantic? While many think not, the Welsh think otherwise. Dating back to the seventeenth century, lovespoons have symbolically served up a helping of true love. A lovespoon is an ornately carved wooden utensil etched with hearts, locks, crosses and other symbols. Back in the day, when a man gifted a lovespoon to his lady, it sort of served as an engagement ring! The ancient Greeks and Romans identified roses with their goddesses of love. Today, roses and flowers, in general, are commonly gifted as romantic gestures in many regions. In fact, in the U.S., it’s customary to present a dozen roses on Valentine’s Day (or whenever); but in Russia, however, giving flowers in even numbers is rude as even floral quantities are typically used only at funerals. A study of twelve developed countries by Oxford University economist Almudena Sevilla-Sanz found that Swedish men have the best potential as husbands because of their enlightened attitudes toward gender roles. Translation: Swedish heartthrobs are down to get dirty by doing household chores. Yup, save the fancy gift-wrapping… I know I’d love the gift of my man tackling the laundry, dishes and mopping. As Americans do, the Japanese gift chocolate for Valentine’s Day. However, instead of gifting a big, red heart-shaped box, women – yes, not the men – give homemade chocolates to several men. No, she’s not a questionable lady with lots of boyfriends… she cooks up certain varieties for different reasons. Special, high-quality chocolate, called honmei choco, is just for her sweetie; friends and colleagues receive other (less-rich, if you will) chocolate. Match-making is the goal of a special pageant of the Wodaabe tribe in the Sahel desert of West Africa. Men wear make-up and dresses and dance to win the love of women. A married woman can even choose to be ‘stolen’ by a better-looking man and leave her husband. Americans joke about making a relationship “Facebook official,” but declaring that you’re going steady is a big deal in Japan. It’s known as kokuhaku, which means “confession.” Yup, it’s like confessing (and professing) your true love for someone and declaring them as your one and only. I’m Irish-American and, so, I have several pieces of jewelry with the Claddagh symbol. A traditional Claddagh ring has hands to represent friendship, a heart to represent love and a crown to represent loyalty. The way you wear it displays your relationship status: (1) right hand with point of heart toward fingertips means single and looking for love, (2) right hand with point of heart toward wrist means in relationship, (3) left hand with point of heart toward fingertips means engaged, and (4) left hand with point of heart toward wrist means married. It’s a wee bit confusing and I do get confused when putting my jewelry on! I’ve learned that other cultures use accessories as love indicators too. For example, in South Africa, Zulu beading communicates feelings and relationship status. Patterns, shapes and colors all carry meaning. The Sisters’ Meals Festival is one of the oldest Valentine’s Day traditions in Asian culture. It involves rice, costumes, dancing, singing and declarations of love. Girls cook rice in four colors, each representing a season of the year, and present the rice to suitors. If he finds two red chopsticks, the girl likes him; whereas finding garlic or chili indicates rejection. If it’s only one chopstick, then the girl has politely turned the suitor down. A girl who hasn’t decided will use a pine needle. My friend Connie and her husband, Scott, lived in South Korea for many years. In this country where public displays of affection are frowned upon, couples show off their love by wearing matching outfits. “They like to dress alike… down to the shoes that are identical or very similar,” Connie describes. And it doesn’t stop there. You may easily notice matching outerwear, like shirts or jackets, but many couples also opt for matching underwear and pajamas. Lies are typically not good for couples but, in Sweden, according to my friend Kari who is Swedish, one marriage tradition includes little white lies before the white dress is worn. A partner lies or tricks his/her future spouse to help pull off a “kidnapping” with friends. It’s similar to a bachelor or bachelorette party, except the bride and groom are taken by sneaky pals without warning. Hmmm… perhaps one way to stop a “runaway bride” is kidnapping! My friend Nicole married an Egyptian man and she told me about how a financial offering is arranged by the future spouse for his lady. If you’re cringing at putting a price tag on a bride, think of this sum of money as a gesture of sincerity. My friend Nicole was not insulted because, after all, it’s somewhat similar to the common gifting of an engagement ring. We all know that diamonds, while a gorgeous token of love, come at a high cost! My friend Seema and her bridesmaids all wore elaborate henna tattoos on the day of her wedding. 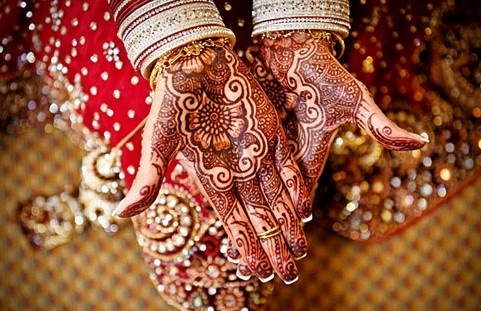 In her Indian culture, henna is applied for wedding ceremonies with the belief that the darker the henna on the bride’s hand, the more intensely her husband will love her. Without understanding the meaning of henna at the time of her nuptials, I thought the artistic designs on her body were truly stunning and that she’d never looked more beautiful. My friend Candace is of Native American heritage and she told me, “An elder gifts the couple with a handmade blanket. The couple then sleeps [or is wrapped] under the blanket, [and] it then blesses their marriage.” Sometimes, the bride and groom are first wrapped individually in blue blankets and blessed by the officiate. Then, the blue blankets are removed and the couple is wrapped in a single white blanket. The blue signifies the couple’s individual pasts, while the white represents the couple’s joint commitment to a new life together full of peace and happiness. “My great-grandmother, before she died, gifted me with two handmade blankets. I was dating [my now husband] Fernando at the time, [and] I would say [it has] blessed us!” proclaims Candace, who is happily married with a beautiful daughter and another baby on the way. At the end of an American wedding ceremony, guests traditionally toss rice at the bride and groom. According to domestic goddess Martha Stewart, the ritual dates back to ancient Roman times where rice was most likely chosen for its availability and low cost. She says the rice symbolized both fertility and prosperity, and tossing it at couples implied best wishes and good luck ─ for newborns, good harvests and everything in between. My friend Jane is of Korean descent and she told me about the pae baek ceremony, where the bride offers her new in-laws gifts of dried dates and jujubes. At the end of the ceremony, “the in-laws and parents throw chestnuts at the bride and she tries to catch them in her hanbok dress (hands are covered under a shawl),” Jane says, adding, “The more she catches, the more kids they’ll have.” Jane says the tradition usually brings about a lot of laughter!